I know I have written about area rug construction before but I thought I would do it again as it has been awhile. Area rugs are constructed in five main ways. These construction methods are hand knotted, hand tufted, hand hooked, hand woven, and machine made. I am not going to talk about machine made. The most desirable and valuable area rugs are hand knotted. These rugs last lifetimes, on average 100+ years depending on the knot count and the construction material. These rugs are usually made from wool and silk. 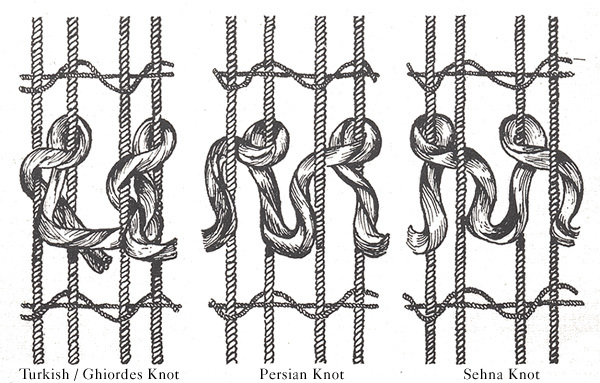 They are constructed by tying a knot around a warp thread. There can be as many as a dozen artisans working on one hand knotted rug and they can take as long as a year to make. One of the major points people look to in determining quality are knots per square inch or kpsi. This can range from 15-2500 depending on the style and quality. For a Peshawar carpet 250 kpsi would be a very high count and be an extremely detailed rug. For a Nain Oriental carpet 250 kpsi would be a very low knot count as most are over 500 kpsi and usually range between 800-1250 kpsi. 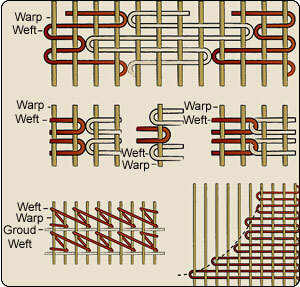 See below for a reference on how these rugs are made and the different styles if knots. The next and the most common style of construction of area rugs are hand tufted. These are constructed by sketching a design on a piece of canvas and then threads are punched threw the canvas. Because there are no knots in this construction method there needs to be an additional backing added to these rugs. These rugs tend to be very plush and will last for years. They are also the rugs that tend to shed in the beginning and need to be vacuumed on a regular basis for the first month of use. The next construction method is hand hooked. 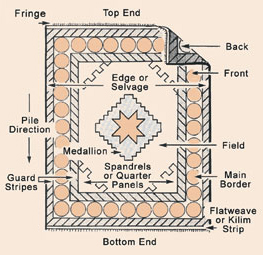 This is a very similar process to the hand tufted except the thread is pulled up in looped pile and not cut off like the tufted rugs. These do not shed as much as the tufted style but they are also not as plush and thick. The last construction style of hand made rugs are hand woven. These rugs last almost as long as the hand knotted and are known for being reversible. These are also your tapestries and are many times used as wall hangings as well as carpets. These are thinner carpets and the main ones that you find are flat weaves or soumaks. These can be found made from wool or cotton. Area rugs are one of the most important elements to designing the perfect space. When you are selecting your area rugs you need to keep in mind ease of use, longevity, quality and touch. And of course there is always budget. Area rugs can range in price by thousands of dollars so before you purchase think about how you are going to use the rug and what you want to pay for one. If you are looking for a great piece of high quality that will last forever then you should be shopping hand knotted rugs. If you want something for a beach cottage that is going to be getting lots of use, sand and salt water then a hand woven is a better option for you. Still not sure what will work best for you? Ask a designer to help you select the right rug for your home or office.